News that Ariana Grande is headlining Manchester Pride has caused quite a stir already, with many arguing that the ticket prices have become extortionate as a result of the big name booking. However, Grande is once again under the spotlight as reports are claiming that she's getting paid €116,000 MORE than Kylie Minogue to perform. Sources close to the pop star are claiming that the Thank U, Next singer is getting a HUGE €291,000 for her Pride show, which hasn't impressed ticket buyers. idk …. ariana headlining pride when she’s straight (as far as we’re all aware) …. and doubling the price of tickets …. kinda smells like exploitation of the lgbt community to me …..
"Hi my love, I have nothing to do with ticket pricing- Manchester Pride sets those rates, and they’re mostly out of my control," she tweeted. "The LGBTQ community has been so special to me and supportive throughout my entire career." "The relationships I have with my LGBTQ fans, friends, and family make me so, so happy,’ she continued. "I want to celebrate and support this community, regardless of my identity or how people label me. And also I wanna visit a city that means so much to me." "LGBTQ representation is incredibly important, and I’m always proud to share the stage with LGBTQ artists! Over the years, pride events have been headlined by performers and artists of all sexual orientations and genders, including straight allies like Cher and Kylie Minogue," she said. "I’m not claiming to be the hero of the community or the face of the LGBTQ rights movement – I just wanna put on a show that makes my LGBTQ fans feel special and celebrated and supported. That’s all I wanna do," she concluded. "Obviously they’re both massive stars but Ariana is like gold dust at the moment, so the organisers offered her top whack to take part." The 25-year-old has paid attention to the criticism, but claims that ticket pricing was out of her hands. Kylie Minogue herself has yet to comment on the whole debacle, but the pay difference is most likely due to Ariana's demand. As a recent Grammy winner, as well as releasing two albums over the last six months which have both reached number one, she's one of the world's most popular pop stars. 7 Rings, Thank U, Next and Break Up With Your Girlfriend, I'm Bored show no sign of leaving the charts anytime soon, and we definitely can't get them out of our heads. They're bangers. What do you think of the debate on Manchester Pride? Is it acceptable for allies to get paid that much? Olly Alexander from Years & Years recently pointed out that Pride will support more LGBT+ artists when people LISTEN to those artists' music, to hike up demand for them at festivals and concerts. It's a two-way street; support can't just be shown one day of the year at Pride for LGBT+ musicians; it has to be 365 days a year for it to make an impact. Queen of social media, Chrissy Teigen, has raised a vitally valuable question about the differences of interviewing men and women. The world has a pop culture fascination with Chrissy and her husband John Legend's relationship; they're both witty, socially aware and created ADORABLE children. However, there's taking an interest in their family life, because they do share quite a lot with their following, but there's also taking questions way too far. Chrissy revealed this week that John constantly gets asked, "How do you deal with your wife", and we are not happy. I feel like a very common question when interviewing john is basically “how do you deal with your wife” and … I don’t love it. "I feel like a very common question when interviewing john is basically “how do you deal with your wife” and … I don’t love it." We wouldn't love it either, because she would never get asked how she deals with John. She elaborated on the question and how she feels about it, and it's relatable as always. It happens a lot. “does she ask you if certain things are okay to say?” …it’s just very weird to me. "It happens a lot. “Does she ask you if certain things are okay to say?” …it’s just very weird to me," she said. "No. He doesn’t. I don’t care. and he doesn’t care. End of question." she tweeted, continuing the thread. Shut that sh*t down, Chrissy. Asking how you "deal" with your wife implies that she's difficult to live with, and causes hassle in his career. Chrissy has her own illustrious career, and yet never gets asked the same question about her husband. he usually does the standard “no…she knows what she’s doing…” but it’s not even that. It’s just that I am a different human than him? It is theeeee most common question with him. Please stop. "He usually does the standard “No…she knows what she’s doing…” but it’s not even that. It’s just that I am a different human than him? It is the most common question with him. Please stop." Rightfully so, Chrissy said John usually shuts the question down fairly easily, but emphasised that she's actually a different person than him with her own life and goals, who isn't just tied to him while he goes out and earns. "I’m not mad at anyone who has asked this. I get that we are very different. It happens a lot though and I’m just not very into it. You don’t ask me how I deal with watching MSNBC every night or what I do while he’s silent for a week." Damn straight, Chrissy. They're basically implying that she's mouthy and loud and controls the voice in the household, and how does he COPE with that as a husband? Teigen isn't afraid of using her social media platform and sharing her opinions on mum-shaming, body-shaming, IVF, postpartum depression and the political situation in America right now. 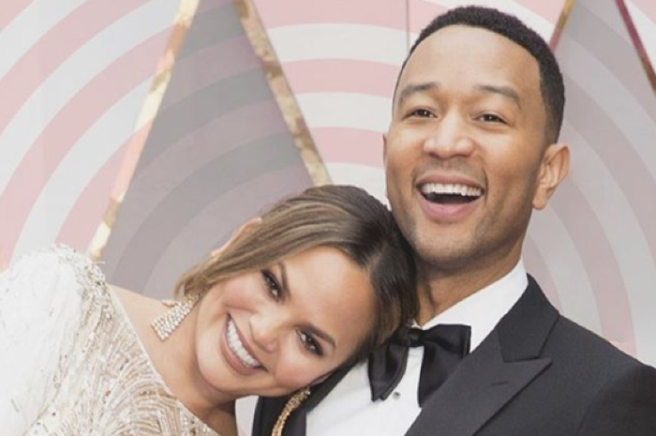 By asking John Legend but not Teigen about his coping mechanisms when it comes to his partner, the basic tone of the question is that it must be a hardship to be married to an outspoken woman, we think. *Eye roll* The man has an EGOT (An Emmy, several Grammys, an Oscar and a Tony) and THAT'S the most common question he gets asked? How does it feel being married to an opinionated and thoughtful lady? We can think of far more complex things to ask the hugely successful musician, to be honest, that don't involve the notion of a woman using her voice for empowerment. They're separate humans with separate careers, people. 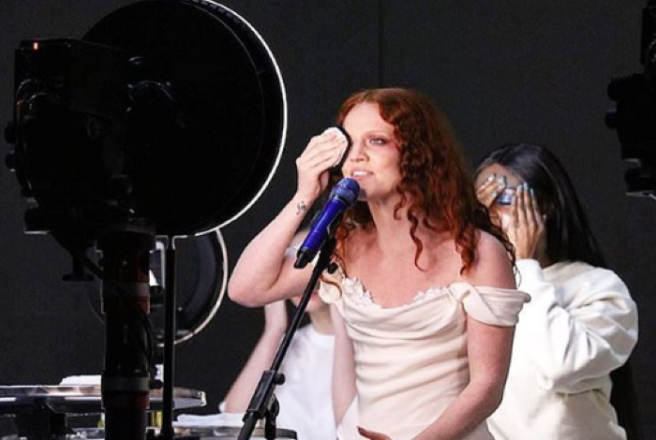 Jess Glynne's Brit Awards performance has been hailed as "inspirational" after she removed her makeup during the song, backed by a legion of women. She performed her hit single Thursday surrounded by fellow ladies removing their cosmetics in front of the audience, and we got CHILLZ (They're multiplyin'). 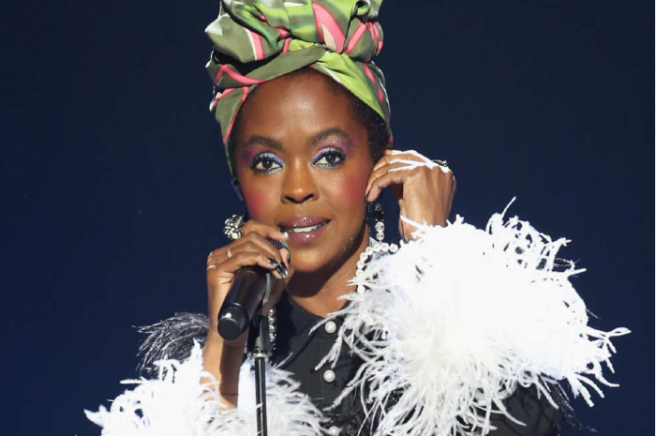 Glynne looked stunning in a white strapless dress for the rendition, and emoved her false eyelashes and wipes off her eyeshadow during the lyrics; "I won’t wear makeup on Thursday, 'cause who I am is enough”. The star was joined by a group of fellow women who also donned white for the occasion, and simultaneously removed their makeup using hand towels in front of vanity mirrors. Halfway through the tune, the British singer was joined by two-time Grammy winner H.E.R, and the standout moment became all the more powerful. A video of countless women removing makeup played behind them, showing the need to fight back against society's strict and unrealistic beauty standards for women. Jess Glynne and H.E.R SLAYED that performance. Twitter has gone absolutely wild with praise for the pair, with one person even tweeting; “That was one of the most empowering performances I’ve ever seen." YAS. The moment came just after The 1975 frontman and absolute feminist legend Matt Healy accepted band’s award for “Best British Group” and spoke out about misogyny in the entertainment industry. Healy quoted an article written about singer Ryan Adams by friend and music journalist Laura Snapes, who writes for The Guardian and Pitchfork. Bravo Jess, and Bravo Matt. We love you both, keep slamming the ridiculous standards of the music business. Cardi B has been ALL OVER the internet lately, from expletive-filled rants to winning Grammys to adorable Kulture videos. We just can't get enough, never let it end Cardi. You're a treasure to us all. Except when she gets really X-rated with her hubby Offset (cheater, cheater, compulsive eater). We ain't here for that. After making history for being the first woman ever win Best Rap Album at the Grammys last Sunday, Cardi has announced a brand new single is being released today with Bruno Mars. While we're delighted that the rap goddess is collaborating again with her Finesse singing partner Bruno, we did NOT need the Valentine's video with Offset. Basically, the 26-year-old posted a Valentine's Day video featuring her husband, while playing a clip of her new song (which sounds like a banger). It essentially involves her Migos lover grinding against her head (yes, seriously) while she mouths the words of her own rap in the song. Help. She captioned the video; "PLEASE ME OUT NOW! CARDI B AND BRUNO MARS…HAPPY VALENTINES DAY, WE GETTING REAL F*CKING FREE TONIGHT." We're not exactly sure what that means, so we asked Google Translate. They didn't know either, but suggested Cardi is just expressing excitement for sexual contact with her husband on Valentine's Day and the release of her new single with Bruno. Seems legit. If anyone need an injection of cuteness, make sure to watch their daughter Kulture say 'mama' over and over, while Offset tries to make her say 'papa'. It's just so pure. Posting to Twitter, she teased Offset about their baby's favourite word; "This what happens when you throw in my face that she said papa first; now she can’t stop saying mama." 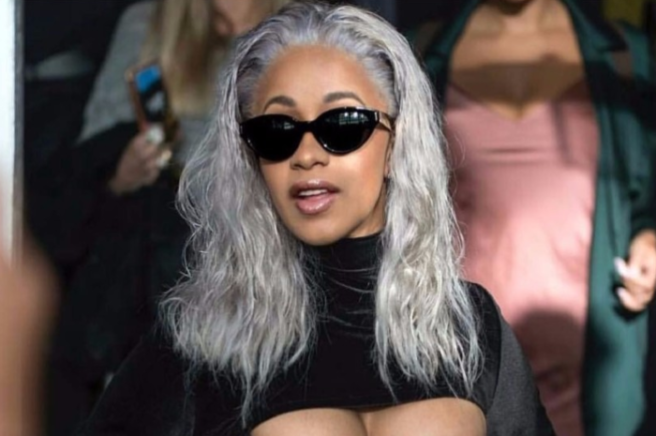 We have to hand it to Cardi, she always provides the entertainment factor. Ariana Grande has some SERIOUSLY dedicated fans, who will back her up no matter what the circumstances are. Even if it means destroying a new song of hers to replace it with a slightly newer banger. The Sweetener singer has proven herself to be a good sport, and now she's supporting a campaign against her own single (and pure BOP) 7 Rings. Basically, the 25-year-old singer has dropped track after track for her loving fans, and they want her latest single Break Up With Your Girlfriend, I'm Bored to take the number one spot. The song features on her new album (the second in six months) called Thank U, Next, and has some pretty controversial lyrics. Some call it toxic femininity to encourage a man to break up with his girlfriend to get with her, others say it's just another incredibly catchy banger from our gal. Oh, and the video features the SEXINESS of Charles Melton. If you're unfamiliar with Melton's work, he's basically one of the hottest lad on the Riverdale planet. And there are many of those, as we know. Ari's fans are either sneaky or pure genius, we can't decide. It seems the singer herself is very open to the chart swap, throwing her support behind the campaign. She wrote to Twitter; "Y'all are so insane and funny and I love you. 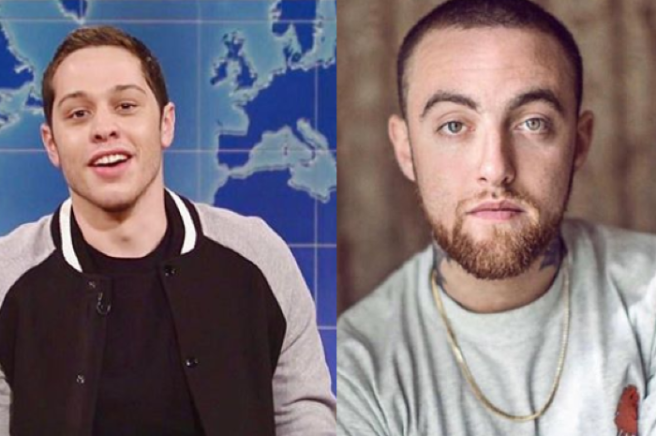 Nothing's funnier than “boycott seven rings”….. I can’t. Whatever’s meant to be will be, babies. I ain’t going nowhere." They really are insane. To be fair, the campaign is a total win-win for pop's reigning princess. Fans begged her to tweet the hashtag, which she did but later deleted, writing, "Are you happy now?" We're guessing they were ecstatic. "This is a wild time for us, do ur thing but also like how is this our problem right now …… what the f*ck." Break Up With Your Girlfriend, I’m Bored is 100 percent a stand-out hit from her new album, and the saucy music video is helping. The gal can't escape the huge chart success, so we wish her our congrats. She deserves it with all those tunes she's dropping, and even got a Grammy out of it. 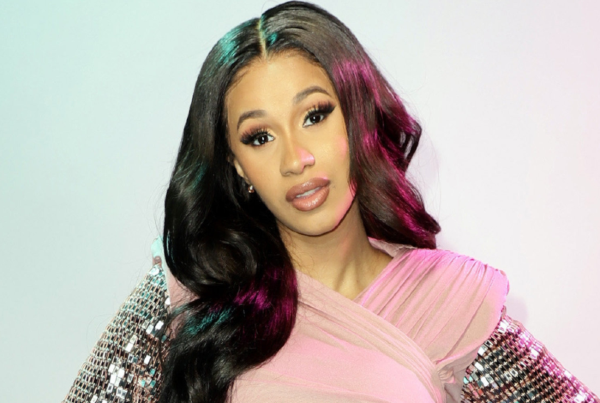 Rapper Cardi B has opened up about her experiences of suffering from post-partum depression following the birth of her daughter, Kulture Kiari. The I Like It singer revealed her emotional rollercoaster following childbirth, explaining how she assumed she'd "avoid" developing the common condition. The 26-year-old spoke to Harper Bazaar for the March cover issue, and elaborated on the difficulties of facing life with the feeling of heaviness. “I thought I was going to avoid it,” she revealed to the magazine. “When I gave birth, the doctor told me about postpartum, and I was like: ‘Well, I’m doing good right now, I don’t think that’s going to happen." She also got candid about the feeling of losing control over your body following pregnancy, admitting that her body "doesn't feel the same". She said: “For some reason, I still don’t feel like my body’s the same. I feel like I don’t have my balance right yet. When it comes to heels, I’m not as good at walking anymore." Cardi B welcomed Kulture in July with her rapper husband Offset, but the pair announced their divorce shortly afterwards. The couple secretly wed in September 2017, insisted that the split was good for both of them, and that they simply "fell out of love". They have reportedly reunited after she rejoined her husband at their family home in Atlanta, but Cardi as yet to confirm the claims. Grammy-nominated singer Bebe Rexha has just SHAKEN our rage cages by revealed designers are turning down the opportunity to dress her for the Grammy Awards. Why? Well, because she's a (stunning) size eight. The 29-year-old is nominated in the Best New Artist and Best Country Duo/Group Performance categories at the upcoming awards show, and claims she's having trouble finding the perfect gown because of designers and their weight expectations. "So I finally get nominated at the Grammys and it’s like the coolest thing ever,"
"And a lot of times artists will go and talk to designers and they’ll make them custom dresses to walk the red carpet, right? Like you go to any big designer. So I had my team hit out a lot of designers and a lot of them do not want to dress me because I’m too big," she added. "You’re saying all the women in the world that are a size 8 and up are not beautiful and that they cannot wear your dresses," she said. "So all the people who said I’m thick and I can’t wear your dress, f*ck you, I don’t want to wear your f*cking dresses." YES GURL, YOU TELL 'EM. 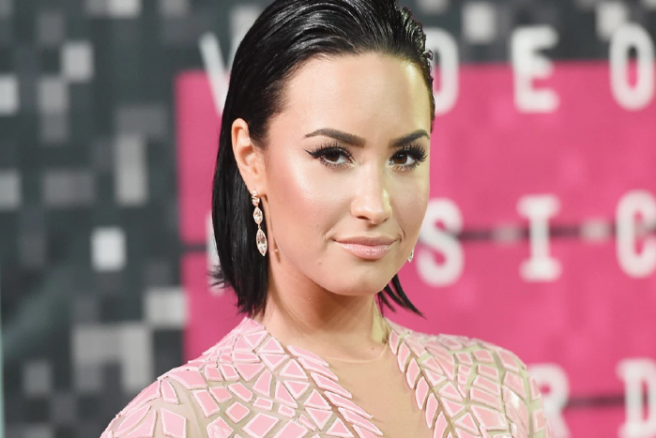 Demi Lovato vows: "I will never take another day for granted"
The 26-year-old singer has had a turbulent year to say the least, but Demi Lovato has shown how truly grateful she is to be alive. Many celebrities were posting their highlights from the past year, and their 2019 resolutions, but Lovato chose the moment to declare how happy she is to have survived her ordeal. It was only five months ago that the Skyscraper singer almost died from an accidental overdose at her home in the Hollywood Hills. "So grateful for the lessons I've learned this year. I will never take another day in life for granted, even the bad ones," she said. 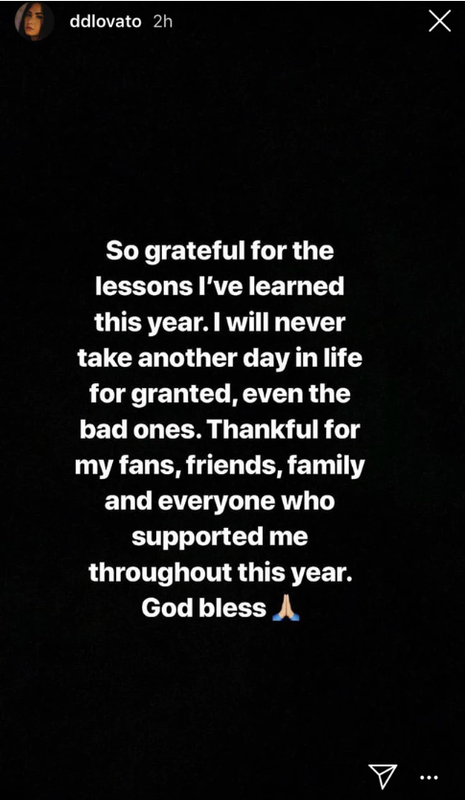 "Thankful for my fans, friends, family and everyone who supported me throughout this year. God bless." The post comes following the singer's two month stint in rehab earlier in the year, where she received treatment for substance abuse addiction. "I have always been transparent about my journey with addiction," she claimed. "What I've learned is that this illness is not something that disappears or fades with time. It is something I must continue to overcome and have not done yet." 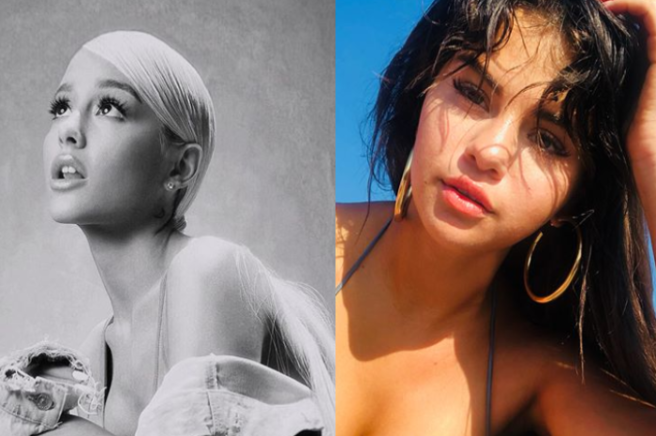 2019 looks set to be a positive one for the artist, with her rumoured new relationship with designer Henry Levy, and a Grammy nomination for her collaboration with Christina Aguilera on the track Fall In Line. "Today could have been one of the worst days of my life, but instead I get to spend it thanking God, the incredible doctors, Demi's team, and everyone across the world who offered their support — without all of these people i wouldn't have my big sister anymore." We're so glad that her recovery appears to be well on the way, and that she is surrounded by a healthy support system.